How to turn an ordinary trophy plaque awards into a "WOW" award that recipients love! When the local fire department announced that they’d be giving their firefighters a laser engraved plaque at their year-end recognition event a loud moan was heard across the crowd. The organizers of the event took that feedback to heart and decided to choose a different award to freshen up the year-end recognition occasion. The firefighters were delighted to hear this news! After years and years of giving employees a walnut plaque with engraved plate the organizers started looking for something totally unconventional but still fitting for a primarily masculine group of recipients. With a bit of planning and creative pursuit an amazing 3-dimensional, deep etched and color-filled award was born. It was quickly realized that the best imprint option for this award in group of recipients was 3D subsurface engraving. The 3D application was unexpected and unique and a broad alternative from a wall plaque. More importantly it allowed for enough detail that the minutia of the firefighter uniform, equipment and water splashing with were depicted with accuracy. 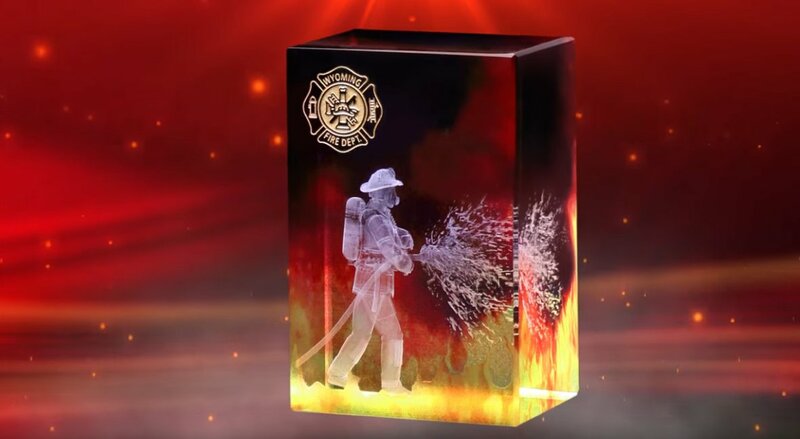 To make the award even more dramatic we chose to accompany the image of the firefighter with a full color blazing background using illumachrome. And added a deep etch of the logo to the front of the award. The recipients of this award were impressed with its overall design but especially the attention to detail. All the elements of the uniform, work boots and equipment were visible and accurate. In addition, the award was so colorful it simply could not be ignored. The recipients enjoyed sharing their awards with their family members and friends.